Notes: Additional details will be added to the Chapter data pages. 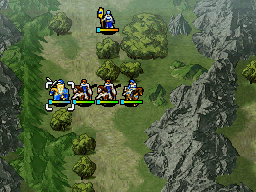 This is a remake of BS Fire Emblem: Archanean Chronicles, four standalone chapters that were originally released for the Satellaview add-on for the Super Famicom (SNES) and broadcasted for a limited time only. It can be accessed from the Extras menu after Prologue 8 of the main campaign has been completed. For more information on the original games, please check this page. These chapters take place chronologically before Shadow Dragon. They are not affected by nor do they affect the main campaign. No voice-acting, unique portraits, CGs or remixed songs. Some of the dialogue is slightly different, for example King Archanea does not appear in Episode 1. Victory conditions have been changed and there is no physical time limit for each chapter. The sum of the four ranks below. Maximum value is 999, although this cannot be achieved realistically. Turns taken to complete chapters. In Episodes 1 and 4, the maximum score is 195 points, with 5 points deducted for each passing turn beyond Turn 1. In Episodes 2 and 3, the maximum score is 200 points, with 5 points deducted for each passing turn beyond Turn 5. Number of chests opened or villages visited by playable characters. 50 points for each chest in Episode 1 (max of 3). 50 points for each village in Episode 2 (max of 2). 20 points for each chest containing 200G in Episode 3 (max of 11). Note that recruiting Maris reduces the points by 50, since she takes 500G for herself. Seems to be fixed at 0 points in Episode 4 (visiting the village or obtaining the items from the Thieves has no effect). Number of playable characters alive at the end. 20 points for each character (max of 5-7, depending on the chapter). Total amount of experience gained. 1 point is awarded for every 10 experience points gained. In Episodes 1, 2 and 3, 50 points are awarded to begin with.